Discussion in 'Online Games - News and Reviews' started by Marina, Dec 30, 2013. Lucky88 Online Video Slot from Aristocrat will surely delight any online slot player. 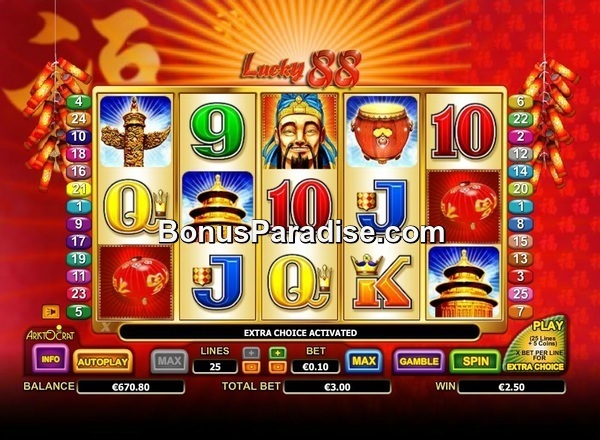 This Asian themed video slot has eye popping graphics and fantastic sounds. Venture to the Orient and catapult yourself to riches with Wilds, Scatters, Rolling Dice and an incredible free spin feature. 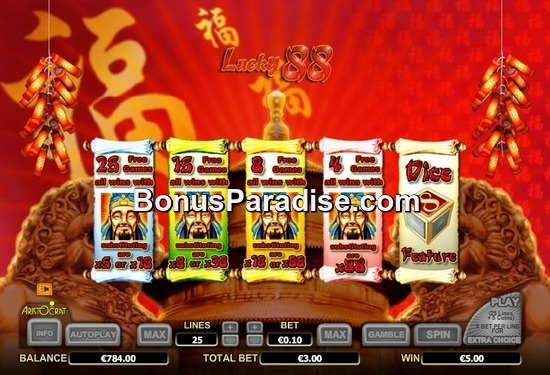 88 is considered the lucky symbol in Asian culture and it is present throughout this video slot. Aristocrat also developed a special feature called Extra Choice where your dreams of riches could come true. on the bottom right of their screen. By playing the Extra Choice feature, it maximizes benefits during the free spin feature; discussed in detail below. The game interface is easy to navigate. There is an info button for information about the game, buttons for bet amount and number of lines, a button for Max bet amount and there is also a gamble feature. Dependent on your coin size per bet and number of lines played, your bet amount per spin will vary. The gamble feature allows you a chance to increase your winnings for a winning payline. Players may choose the button for a total of 5 times. A red or black correct choice doubles your winnings and by choosing the correct suit, your winnings are quadrupled. All wins pay left to right except the Paper Lantern Scatter symbol which can pay in any order. Man is wild and substitutes for all symbols except the Paper Lantern Scatter. With the Extra Choice feature activated, if you receive 3 or more Paper Lantern Scatters you start the feature. You can choose between free spins or a chance to roll the dice. There are 4 free spin options to choose from. Should a Wild symbol appear in a winning payline, the multiplier could be significant. Choose 25 free spins. If a winning payline has a Wild symbol, the multiplier could be worth 5x or 18x. Choose 15 free spins and if a winning payline has a Wild symbol, the multiplier could be worth 8x or 38x. Choose 8 free spins and if the winning payline has a Wild symbol, the multiplier could be 18x or 88x. If you choose 4 free spins and the winning payline has a Wild symbol, the multiplier is a whopping 88x. The feature can be retriggered at the end of any spin or be activated again by receiving 3 or more Paper Lantern Scatters. You could also choose the Dice feature by receiving 3 or more Paper Lantern Scatters. A screen appears with 9 dice. The outer 8 dice roll. If an 8 appears, that dice is held in place and the other dice continue to roll. At the end of each roll, the number of 8's determine the amount you have won. After 3 rolls of the dice, the center dice is rolled and you could win an additional 3 more games. Free spins when the Extra Choice is not in play: Receive 3 or more Paper Lantern Scatters and you will receive free spins. You have the choice of 3 Free Spin options. Choose 20 free spins and if a wild symbol appears in a winning combination, the win is multiplied by 5x or 18x. Choose 10 free spins and if wild symbol appears in a winning combination, you will receive 8x or 38x the win. Choose 3 free spins and if a wild symbol is in a winning combination, your win is multiplied by 18x or 88x. The free spin feature can be re-triggered. Whether you're playing the Extra Choice or not, entering the free spin round could really earn you some great winnings. The Dice feature can be substantial as well. Wow the Lucky88 Slot looks really cool! Thank you so much for this nice review! I was able to play for now.....since i am from the Netherlands, i wonder for how long. Many casinos blocking dutch players from the Aristocrat Slots.